The Punjab Government while defending the termination of all water-sharing agreements, informed the Supreme Court that it was under no obligation to build the Sutlej Yamuna Link canal despite the earlier court orders. At least 73 persons were killed today in a Baghdad car bombing and an ambush on the police in Baquba, claimed by Al-Qaida-linked militants, as fighting flared between the US troops and insurgents in Ramadi. Fifty persons perished in Baghdad, 47 of them when a vehicle packed with explosives blew up outside the main police headquarters. Prime Minister Manmohan Singh will have substantive talks with US President George Bush and Pakistan President Pervez Musharraf during separate bilateral meetings in New York next week, sources said today. He was the CEO of this company. He is here due to the power crisis. Ahead of Lok Sabha and Assembly by-elections in Uttar Pradesh, Congress President Sonia Gandhi today said she would take up the increasing incidence of crime and lawlessness in the state with the Centre and the Mulayam Singh Yadav government. 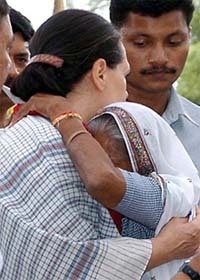 Congress President Sonia Gandhi hugs an old woman in her constituency at Sudhauli block in Rae Bareli on Tuesday. Rajya Sabha MP Ashwani Kumar has made a forceful plea to France to address sympathetically the issue of Sikh children wearing turbans in French schools. Mr Kumar while addressing a visiting Indo-French parliamentary friendship group, said the issue was sensitive. Even as the two-member fact-finding committee constituted by the Shiromani Akali Dal (Amritsar) today indicted Mr Baldev Singh, an SGPC member, for molesting the wife of a raagi, the accused today publicly honoured Mr Parkash Singh Badal, President, Shiromani Akali Dal, at “dhadi darbar” held at Manji Sahib, Darbar Sahib, here today. 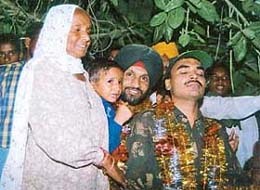 A wave of joy gripped the village when Lance Naik Jagsir Singh, who spent five years in Pakistani jails, accompanied by his friend Sapper Mohammad Arif, reached his house late this evening.